In the world of SEO, few strategies are as widely discussed as link building. Personally, I think it has to do with the semantics of the phrase and the history of the tactic more than the modern approach, but I’ll be visiting that idea shortly. This is a significant topic because external links are the most important source of authority, and therefore ranking potential. Without sufficient links pointing to your domain, you’ll never gain any significant momentum, and because it’s rare that a business naturally attracts all the links it ever needs without effort, a link building campaign is the way to get them. Unfortunately, most novice SEOs and business owners unfamiliar with SEO best practices suffer from a persistent myth that stifles their link building potential, and unless it’s overcome, it will continue to hold back your potential ranks. Here it is. The idea that link building is risky definitely has some legitimate roots. Back when SEO was first starting to emerge, it was common practice to manually place links on external websites in areas like forum threads, blog comments, and directories designed specifically to host links to other channels. When Google recognized the abusive potential for such strategies, it quickly revised its criteria for evaluating the “quality” of a link. Over the years, Google has become more sophisticated at detecting link quality, mostly through multiple Penguin updates. Accordingly, “good” links can pass authority to your site, while a pattern of detected “bad” links might bring your authority down. Therefore, as long as you’re building “good” links, you don’t have to worry about seeing any detrimental effects (unless you’re the victim of negative SEO, which is a topic for another post). Saying link building is risky is like saying driving a car puts you at risk of getting a traffic ticket—you can nitpick the semantics here, but as long as you’re following the rules you have nothing to worry about. For an overview of the rules of link building and how to do it correctly, see Your Guide to Link Building For SEO in 2016. You avoid link building entirely. This is rare, but I’ve encountered it more often than I’ve expected. John Mueller’s passing comment in February 2015 that link building is something to “avoid” in general didn’t help matters here. If you aren’t building links actively, you’re missing out on some enormous potential. 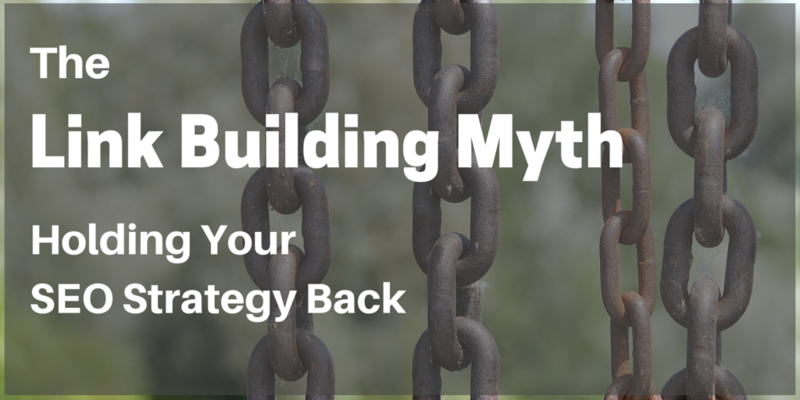 You shelve link building as a secondary strategy. More often, I see SEOs and entrepreneurs only going for links when they have a clear and present opportunity – such as a request for an interview. Again, this crushes significant potential you’d otherwise have to grow your authority. You obsess over rankings. Fearing that link building is like walking through a minefield, you dutifully check your rankings constantly to see if you’ve been the victim of a Google penalty. This is a waste of both time and energy (though good on you for checking your metrics!). Instead of viewing link building as risky, see it for what it is; a system to reward positive contributions and punish negative ones. As long as you aren’t making any negative contributions, you can only gain from the situation. Create link magnets. The first method involves a natural attraction of links. First, you have to produce high-quality content that people would want to share and link to (e.g. an infographic backed by original research). Once syndicated, readers will link to your content as they reference it in other works. For help syndicating it, see The Ultimate Tactical Checklist for Promoting Your Next Blog Post. Off-site content. The second method is more direct, and involves contributing content to external sources. Identify worthy sources (preferably industry relevant and high-authority publications), and submit content to be published that includes a natural, relevant, value-adding link pointing back to your domain in the body or author bio. Best practices are more complicated than this – you’ll have to consider the contextual relevance of your link, nofollow options, and the diversity of your inbound link profile – but this is the basic idea. The rest is a topic for another post. Great article Jayson. We are always teaching and preaching the #LinkLife here @PageOnePower. By chance will you be making it down to Search Fest in Portland next month? We’ll be there and would love to meet. Good article…You are right on…The Penquin PR has worked…Shhhh! I have also seen KW anchor text coming back into vogue now that the spam factor has dropped. But be careful, it is still a delicate spice.